Today I will share a tale of a naval battle, of supposed cowardice and twisted legal wranglings that ended before a firing squad. The case echoes even today, as the family of Admiral John Byng continue their efforts to clear his name. The high-flying Byng enjoyed a highly successful naval career, temporarily putting it on hold to pursue life as a Member of Parliament before he returned to the sea. In 1756 he sailed out of England to join the Battle of Menorca, under orders not to let the French capture Port Mahon under any circumstances. Even as the mission began Byng was plagued by doubt, certain that his vessel was underprepared and sure to be overwhelmed by the forces of the French. Upon his arrival he found the garrison at Port Mahon completely besieged by the French and wrote that he believed his chances of success were slim in the circumstances. Despite this, Byng did go into battle on 20th May 1756 and the result was a far from happy one. With the French forces heavily outgunning their adversaries, Byng's vessel, the Ramillies, ended up towards the back of the English fleet and never came within firing range of another ship. On that unfortunate day several English vessels suffered serious damage whilst the French were untouched. 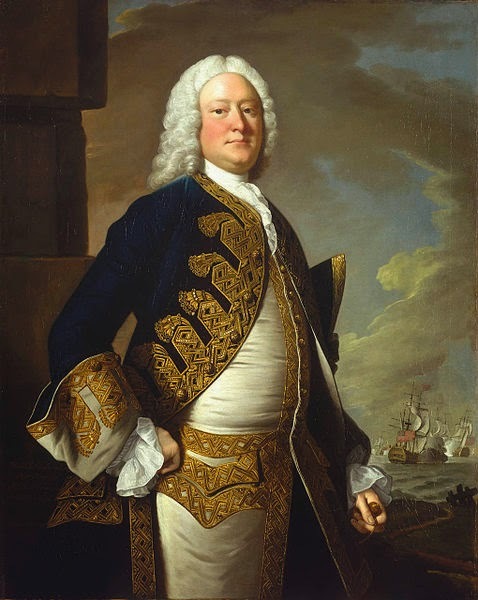 The engagement had been a disaster and as Byng gave orders to head for Gibraltar, an order was issued to arrest the Admiral as a coward who had retreated from battle. "Every Person in the Fleet, who through cowardice, negligence or dissatisfaction, shall in time of action withdraw or keep back, or not come into the fight or engagement, or shall not do his utmost to take or destroy every ship which it shall be his duty to engage, and to assist and relieve all and every of His Majesty's ships or those of his allies, which it shall be his duty to assist and relieve, every such person so offending, and being convicted thereof by the sentence of a court martial, shall suffer death." There was little room for interpretation of the sentence to one found guilty under the 12th Article and so, with the public demanding answers and Crown and parliament keen to settle the matter, the court marital set out to ascertain whether the Admiral had "done his utmost" during battle and to aid his garrison. Byng argued passionately that he had not deliberately kept the Ramillies out of the battle but had been forced to do so by the fact that the opposing forces were at angles to one another, rendering it virtually impossible for him to engage the French from his position. Serving as his own defence he countered that he had been sent to battle without adequate forces and that his sailing for Gibraltar after the engagement had not been in retreat, but by necessity. However, Byng's prosecutors would hear none of it and although he was absolved of cowardice, they ruled that he had indeed failed to do his utmost and the mandatory punishment was death. However, his judges found this inescapable outcome a bitter pill to swallow and unanimously recommended that George II show clemency and grant the Admiral a reprieve. Influential figures raised their voices in support of a lighter sentence and Byng's family campaigned tirelessly on his behalf yet it was to no avail. Petitions brought before the king fell on deaf ears and, believing Byng was a coward, George gave his decision: the death penalty would stand. Byng was taken from his prison on HMS Monarque in the Solent and brought to the quarterdeck at noon on 14th March 1757. Here a firing squad of Royal Marines awaited him alongside the crew of the Monarque and sailors from other ships, all of whom were there to show their support of the unfortunate Admiral. Blindfolded, he knelt on a cushion and dropped his handkerchief to signal he was ready to die. 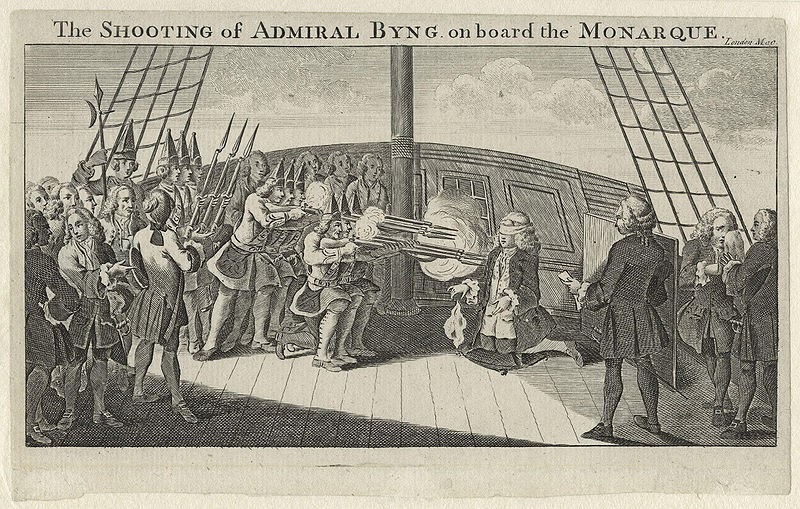 At this moment, the squad fired as one, ending the life of Admiral Byng. Very much so; he was the only senior figure to be executed under the 12th Article so it certainly send a warning shot! NOT one of our most glorious episodes,Madame! Not by any means, sir. I live just three miles from Southill in Bedfordshire, where he is buried in a family crypt under the parish church. I have a picture of the enscription on the front of his tomb if you want it, which shows clearly the bitterness felt by family and friends over his treatment. I cannot include as an attachment here. It sounds as if the poor man was made an example. I wonder if the family was comforted at all by the fact that he was found innocent of cowardice?